Blue-Eyes White Dragon. One of my favorite Duel Monsters of all time. And now that he has his own Archetype I'm gonna try and make a semi-competitive deck. Last edited by Zillabrony13; 23rd November 2015 at 06:50 PM. I'll be honest here: Your build is really good, even if I don't like Notice (make too much things with that low cost). Also, I'll already seen that title elsewhere.... in duelingnetwork perhaps ? I used the name of this thread for a thread on DN Forums where I displayed my old Blue-Eyes Critias deck. I'll consider Melody, but what do you think of Moon Mirror Shield in place of Wonder Wand? It allows your tuners to be viable in battle and triggers both Maiden and Priestess. Your build is really good, even if I don't like Notice (make too much things with that low cost). I'll be replacing Notice with Champion's Vigilance once the new support comes to the TCG. I've used Mirror Shield in a pre-SHVI support build (thanks to a Davinator's deck profile) and I've not been decieved by this card. So yes, viable option. But use Melody then. Also, more I played Priestess, more she looks useless. Melody do the exact same thing but better. Also, White Stone is quite useless now. Consider take them out completely and add a third copy of Twin Twister and use three copy of Melody. Find a room for Keeper of the Shrine. He is a great option in this deck recycling Blue-Eyes and White Spirit to death. Last edited by Indytotof; 23rd November 2015 at 06:44 PM. I'll take out Priestess and White Stone for 2 Melody and 2 Keeper of the Shrine. I think you should definitely run 1 Priestess. While she isn't the best card in the archetype she is a searchable searcher and reusable tuner. Also, fix up that Extra Deck; you're running far too many unnecessary cards. Last edited by Aromaiden; 23rd November 2015 at 10:25 PM. 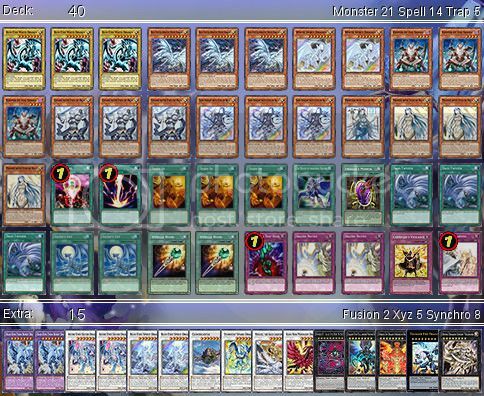 Current Favorite Decks: Ritual Beast, Blue-Eyes, Burgesstoma, Phantom Knights, D/D/D, and Raidraptor. Also, fix up that Extra Deck; you're running far too many unnecessary cards. Like what? What cards are unnecessary? Number 46: Dragulon, Galaxy-Eyes Full Armor Photon Dragon, and Number 107: Galaxy-Eyes Tachyon Dragon. Edit: You can replace these cards with overall better/useful cards. Ex: Michael, Lightsworn Lord, Black Rose Moonlight Dragon, Sylvan Princessprite, Stardust Spark Dragon. Last edited by Aromaiden; 23rd November 2015 at 11:00 PM.